Preheat oven to 450°. Combine dry ingredients. Cut in shortening until fine. stir in milk until well mixed. Lightly knead on floured surface. Pat out and press down until about 1/2 inch thick. Melt a small amount of shortening in a 9 x 13 baking dish. 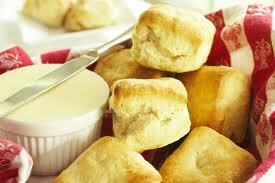 Cut biscuits with a biscuit cutter. Dip in hot shortening, turn over and arrange in baking dish. Bake for 10-12 minutes until lightly browned. Light and delicious! *Note: Evelyn got this recipe from her Buhler High School Home Economics Teacher over 50 years ago! Evelyn gave Vicki a personal “Biscuit Tutoring Session” several years ago and I have made biscuits from this recipe ever since! Delicious, light with a lightly crunchy bottom.